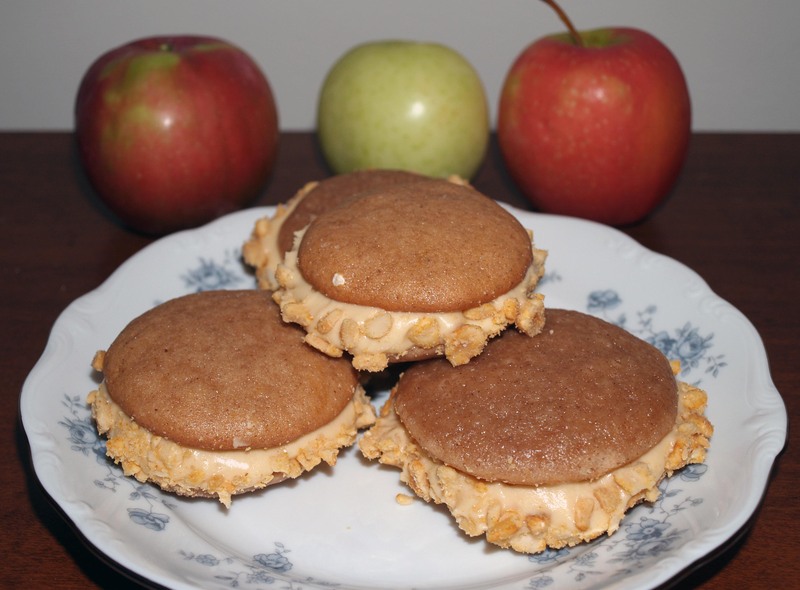 Caramel Apple Whoopie Pies | I Wanna Bake! You may get sick of all my apple posts soon enough, but I never will! This bakeventure started out with a well-intentioned attempt to make caramel apples my husband can actually eat. He likes apples, particularly when they’re covered in caramel and peanuts, but has a strange allergy which makes his throat itch when he eats them raw. Cooked apples aren’t a problem, so I figured there must be a way to give him that tart-sweet-crunchy sensation that embodies fall without any of the itchy throat. These were originally supposed to be frosted cookies along the lines of my Summer Peach Cookies and the Pumpkin Chai Cookies those were based on. However, once the first batch came out of the oven, I knew these weren’t going to cut it as cookies. The other two versions are soft, but these turned out more like cake, possibly from the high moisture content of the apple sauce. Fortunately, all hope was not lost. 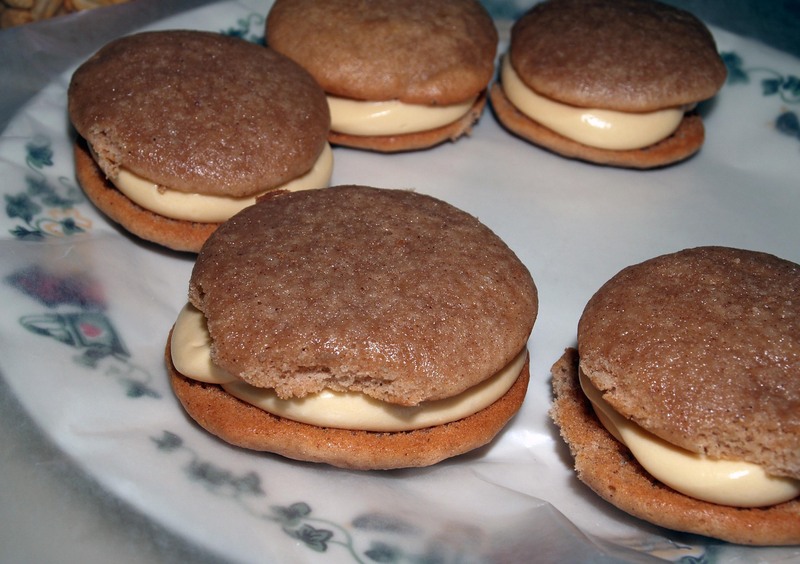 The cake-like consistency made these perfect for the cake parts of whoopie pies. With that idea in mind, I quickly set to work to come up with a filling. 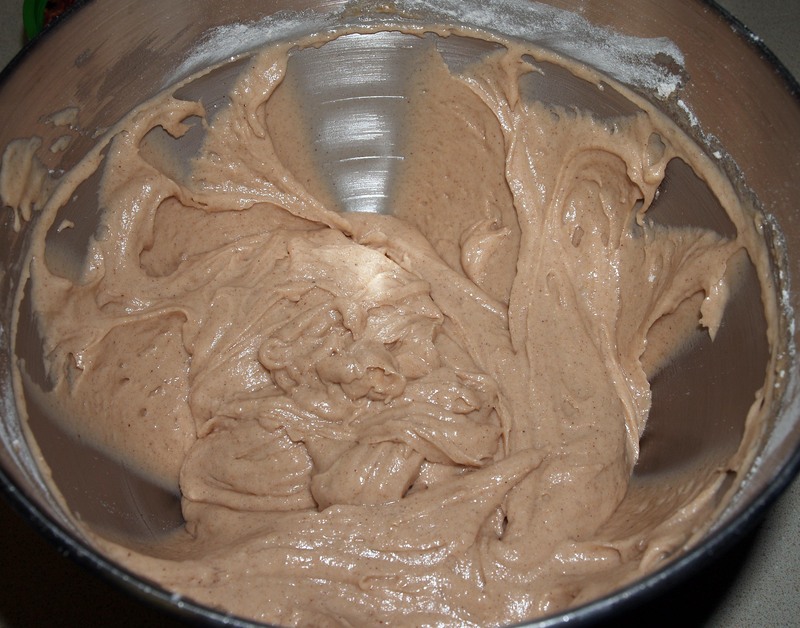 I used Magnolia Bakery’s chocolate buttercream frosting as a starting point and adapted from there. 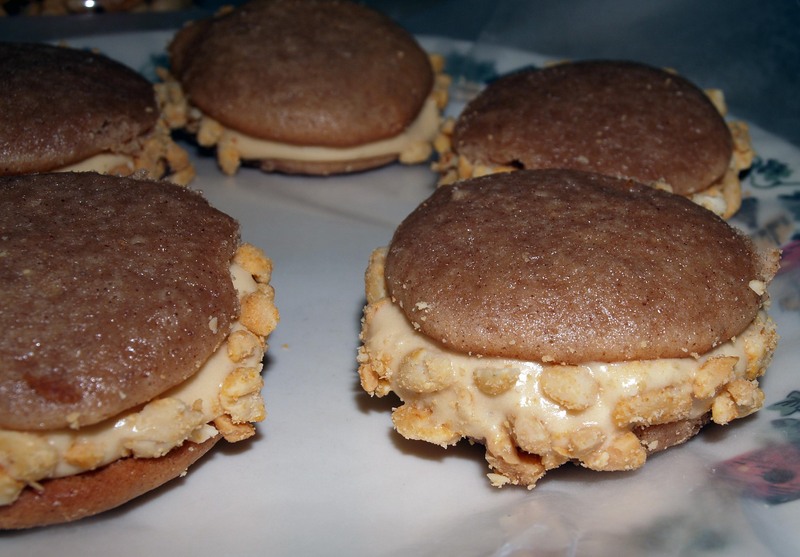 I added significantly more sugar to make the filling hold its shape a little more. If you like your filling a little less sweet, you can decrease the sugar. Just beware that it will want to be anywhere but between the cakes once you put it there. 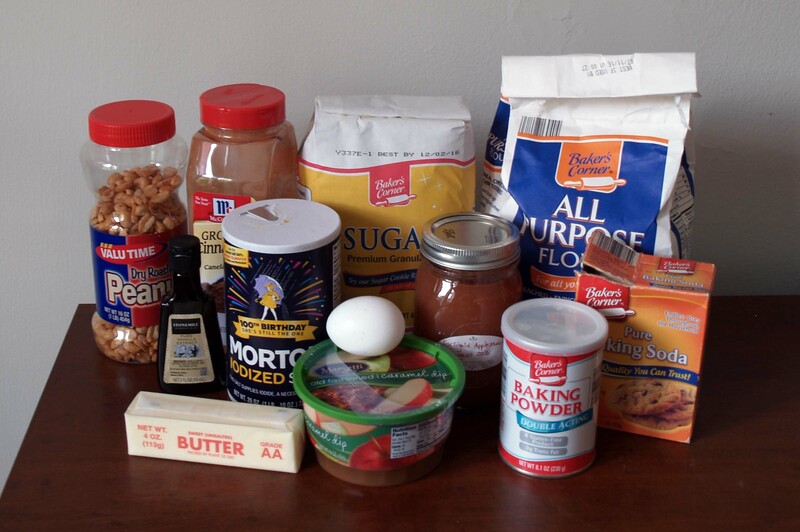 Note that while I included caramel apple dip and dry-roasted peanuts in the ingredients photo, I didn’t end up using them in the cakes. I listened to Cage the Elephant because In One Ear has been stuck in my head since it popped up in one of the various crime shows I’ve been binge-watching lately. Because nothing says delicious baked goods like murder investigations, after all. 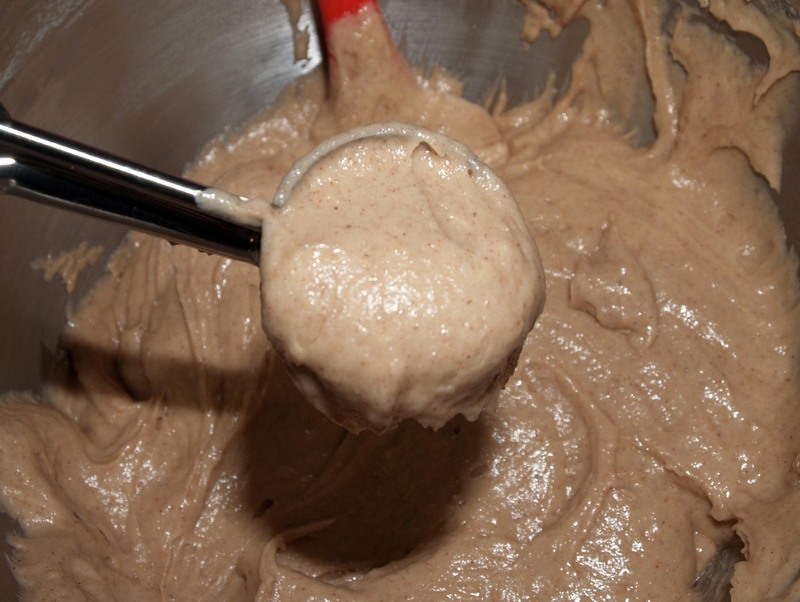 In a medium bowl, whisk together the flour, cinnamon, baking soda, baking powder, and salt. Set this aside. 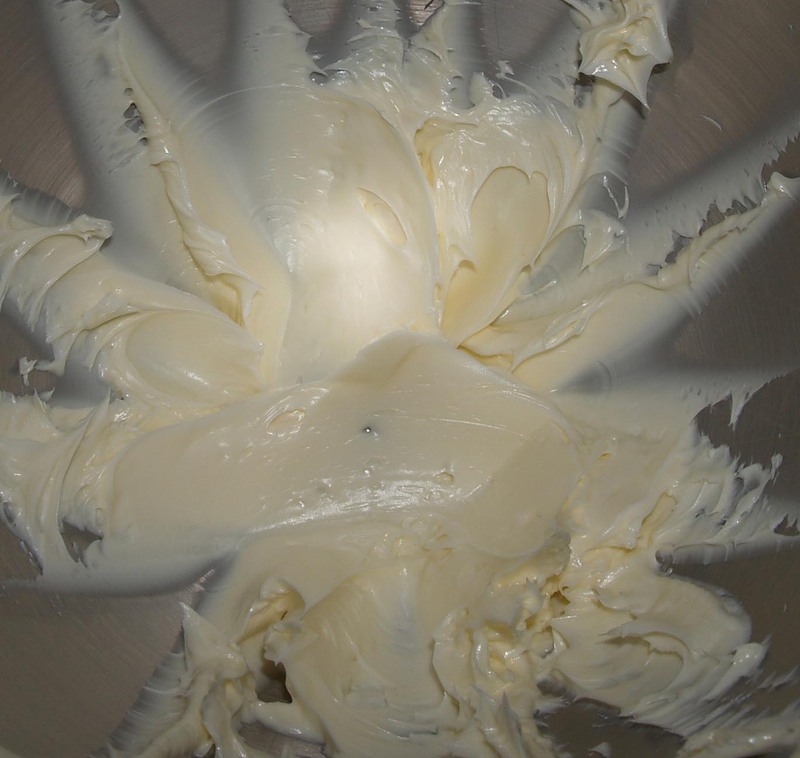 In a stand mixer bowl or other large mixing bowl, cream together the butter and sugar until it is homogeneous. Add in the egg, vanilla, and apple sauce and beat until the mixture is smooth (sorry, the picture of this step came out too blurry). 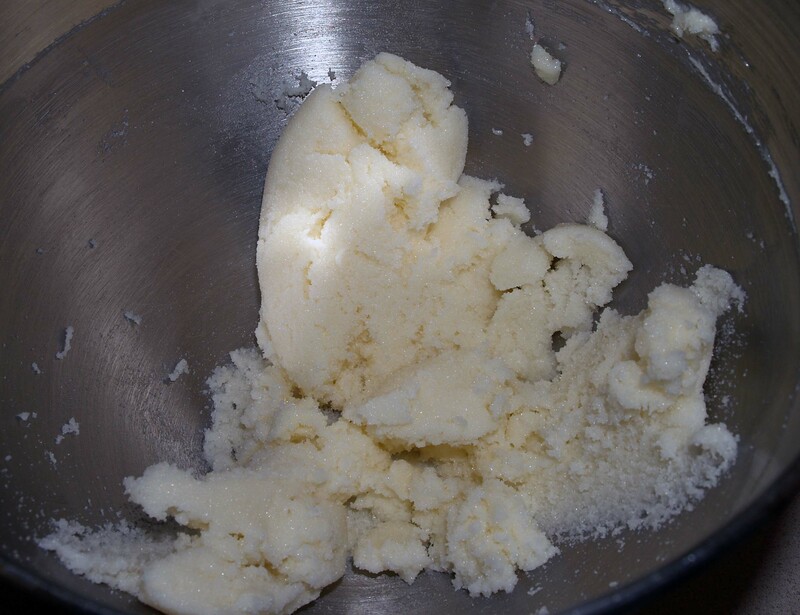 Stir in 1/3 of the dry ingredients at a time and beat on low speed until there are no lumps and the batter is smooth. 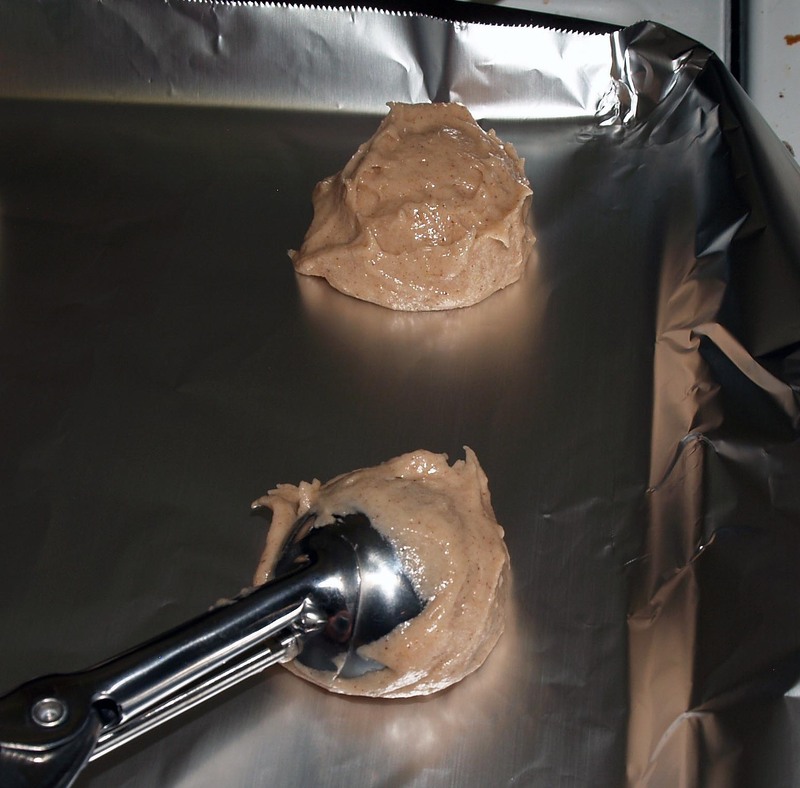 Line your cookie sheets with foil or parchment paper or grease them. 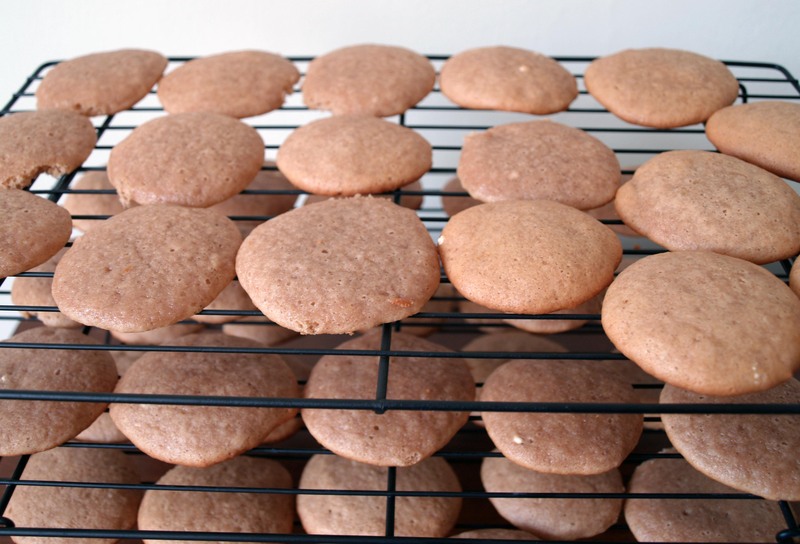 Using a cookie scoop, drop blobs of batter onto the cookie sheets. Try to leave about 2″ between them because they won’t be fully round if they run into each other during baking. 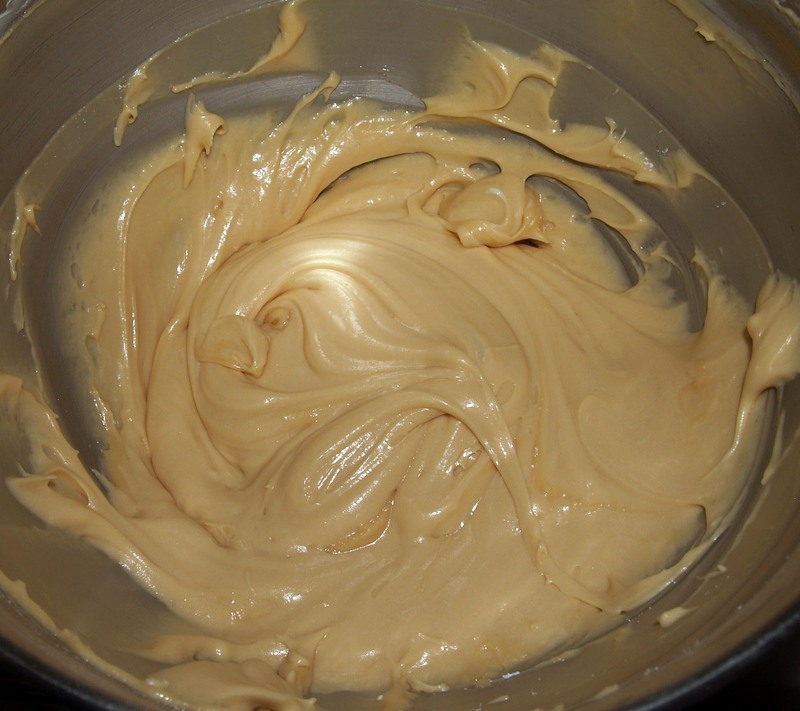 Bake the cakes for 6-12 minutes, being careful to remove them from the oven when you see the edges start to brown. 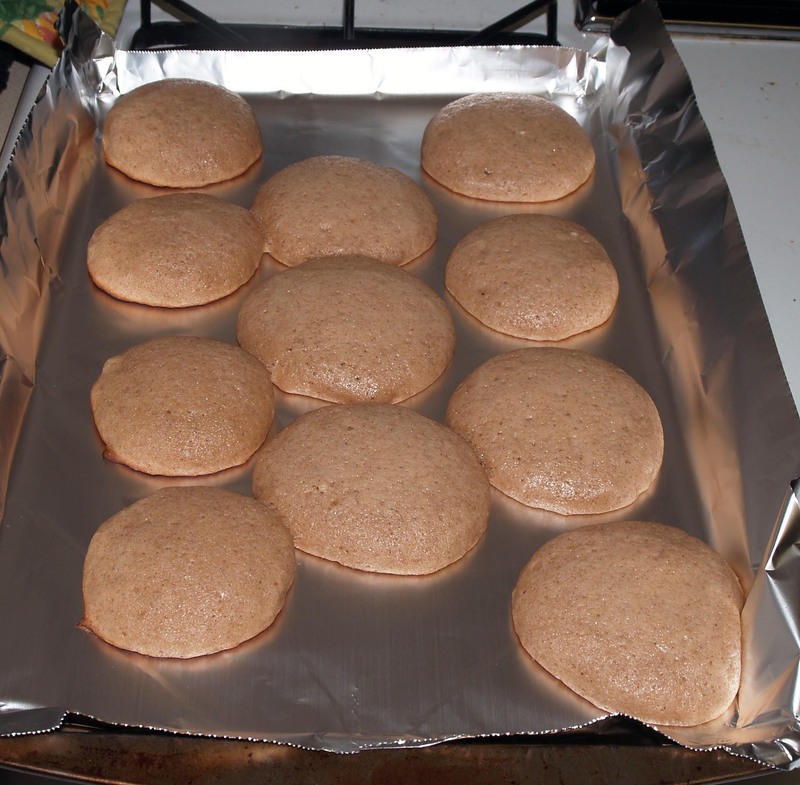 The tops will probably still look underdone, but if you leave these in too long, the bottoms will burn. Leave them to cool on the cookie sheets for about 5 minutes, then carefully remove them to cooling racks to cool completely. They will be a little bit fragile because they’re so soft, so proceed with caution. 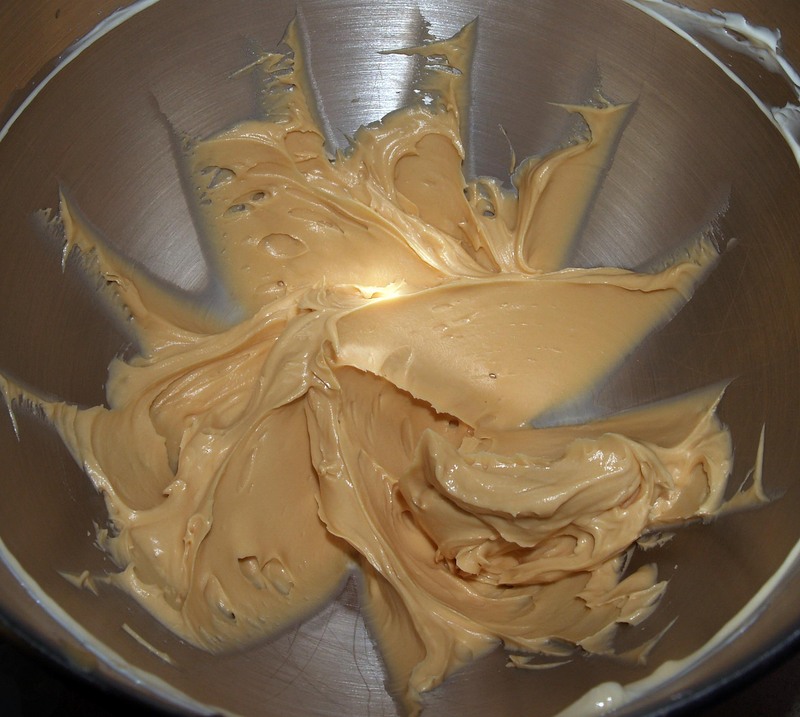 When the cakes are fully cooled, it’s time to prepare the filling. 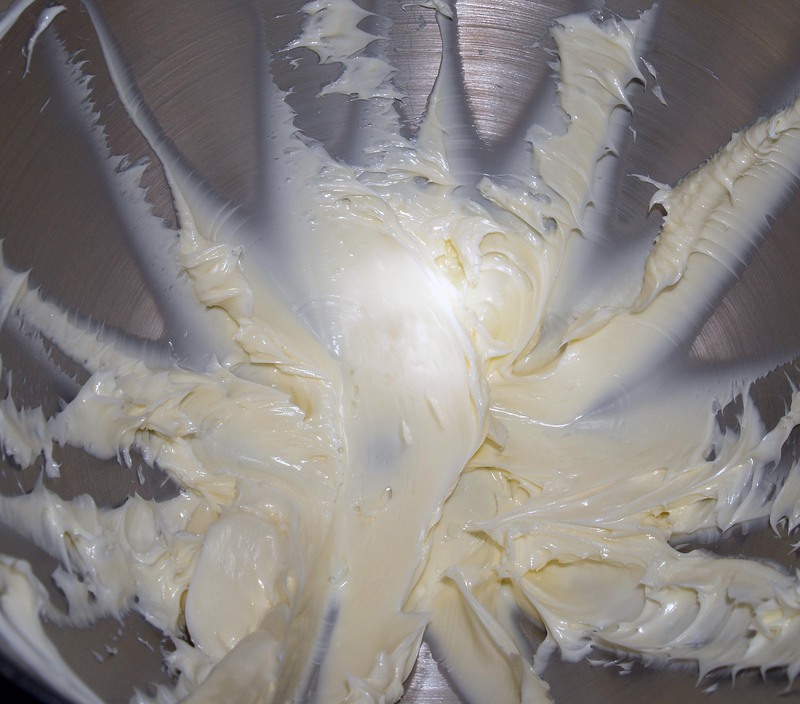 Put the softened butter in a stand mixer bowl or other large mixing bowl and beat it for 3 minutes. Add in the apple cider and (carefully) beat for another 2 minutes. Add in the vanilla extract and beat for minutes. Finally, add in the caramel sauce and beat for another minutes. 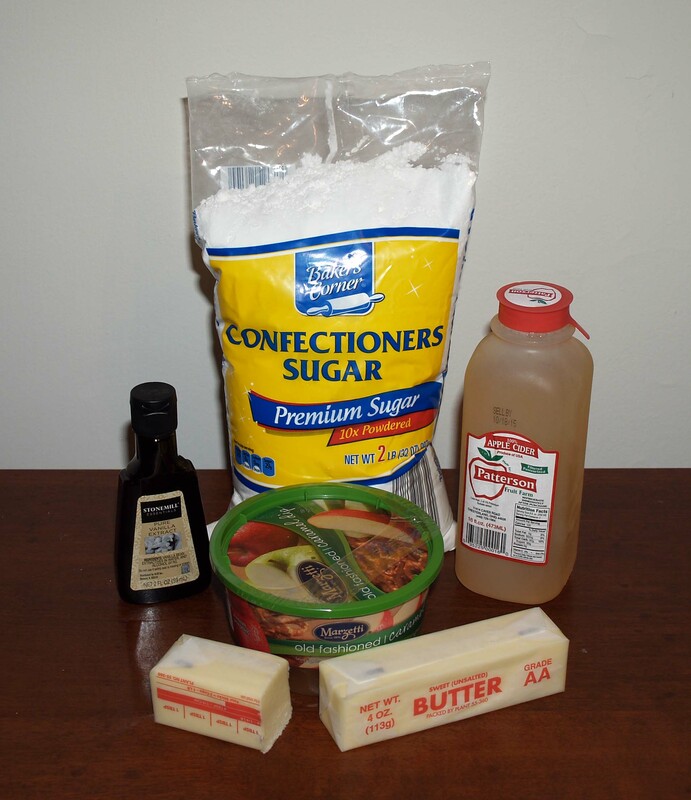 Add the sugar 1/2 cup at a time, beating until it is fully incorporated after each addition. The filling should be able to hold its shape somewhat, but will still fall down fairly quickly when you make a peak out of it. 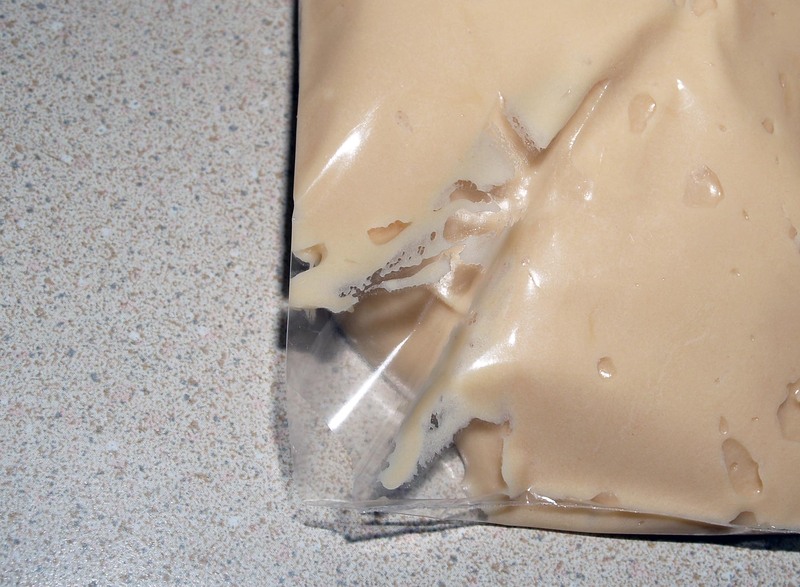 Transfer your filling to a piping bag or resealable gallon bag. Snip the corner of the bag to make a 1/2″ opening. Put the chopped peanuts into a small bowl and begin to pair the cakes off as best you can based on size and shape. Flip over one cake from each pair so that the flat side is facing up. 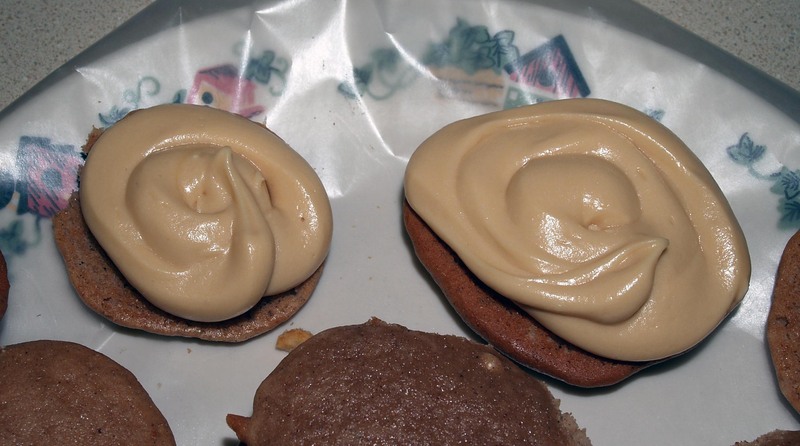 If you are using the peanuts, I suggest sprinkling some on the bottom cakes before you pipe the filling on top. Place the remaining cakes on top of the filled ones. 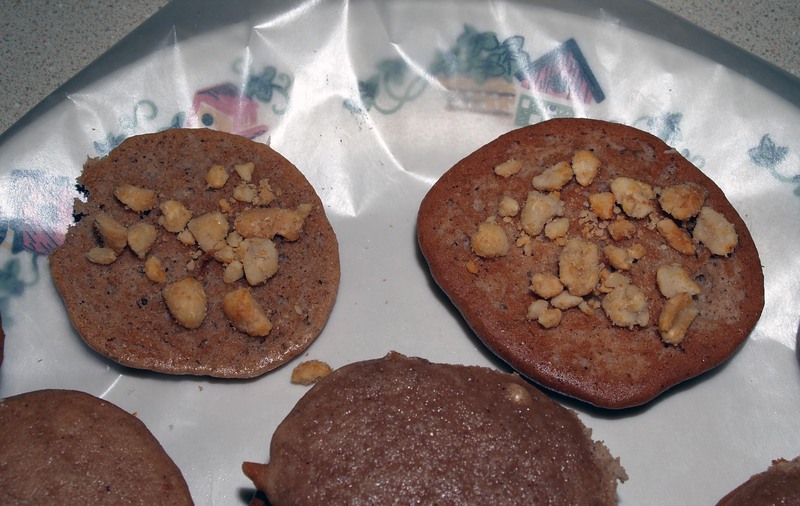 Roll the edge of each whoopie pie in the remaining peanuts. 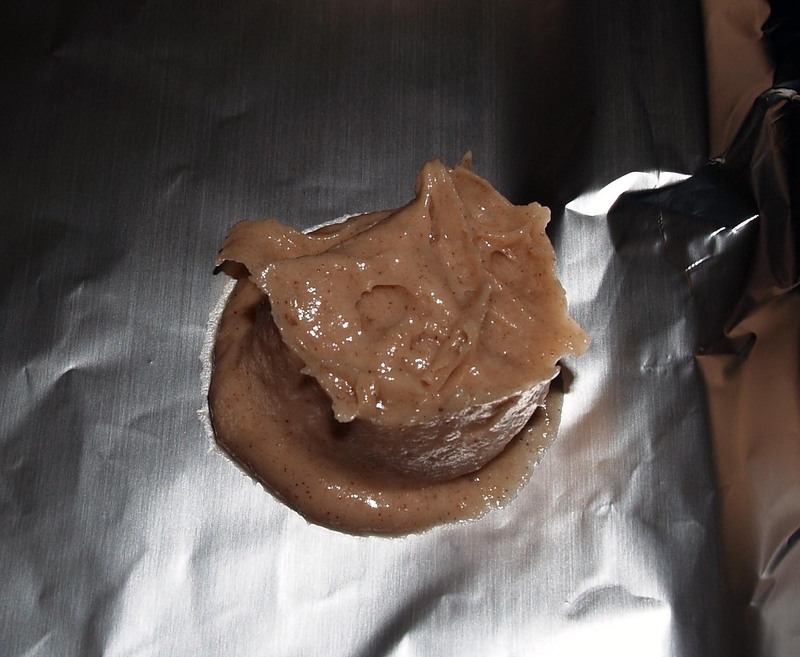 The filling will want to leak out while it’s fresh, but if you refrigerate these, they will firm up nicely.